The New Moon is Friday June 27. Jupiter is low in the early evening sky and is visited by the crescent Moon on the 29th. Mars and Saturn are prominent in the evening sky. 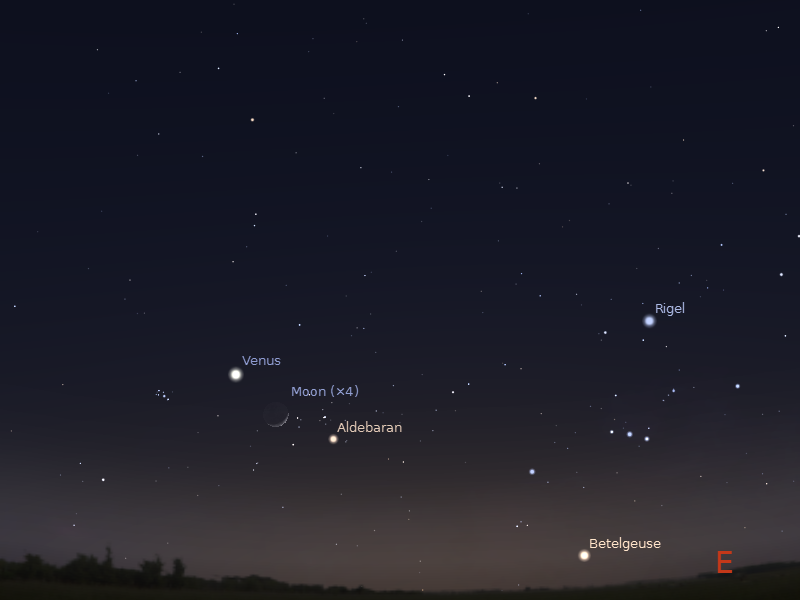 Venus is prominent in the morning sky, coming close to the red star Aldebaran and forming a second "eye" for the constellation of the Bull. The New Moon is Friday June 27.The Moon is at apogee (furthest from the Sun) on July 1st. Evening sky on Sunday June 29 looking north-west as seen from Adelaide at 18:00 pm ACST in South Australia. Jupiter is above the north-western horizon with the crescent Moon close by. Similar views will be seen elsewhere at the equivalent local time (click to embiggen). At 6:00 pm if you have a level horizon free of obstructions, you can see three bright planets strung out across the sky, Jupiter just above the horizon, Mars high in the northern sky and Saturn above the eastern horizon. Mercury has disappeared into the twilight. Jupiter is low to the horizon when twilight ends. Jupiter sets around 19:00, telescopic observation is not really worthwhile now. In the early evening Jupiter is above the north-western horizon between the bright stars Castor and Pollux, the twins of Gemini, and the bright red star Betelgeuse. Jupiter is quite easy to see as the brightest object above the western horizon in the early evening. In the early evening the sight of bright Jupiter sinking to the west, and bright Mars (still not as bright as Jupiter though) to the north and Saturn rising in the east is quite beautiful. 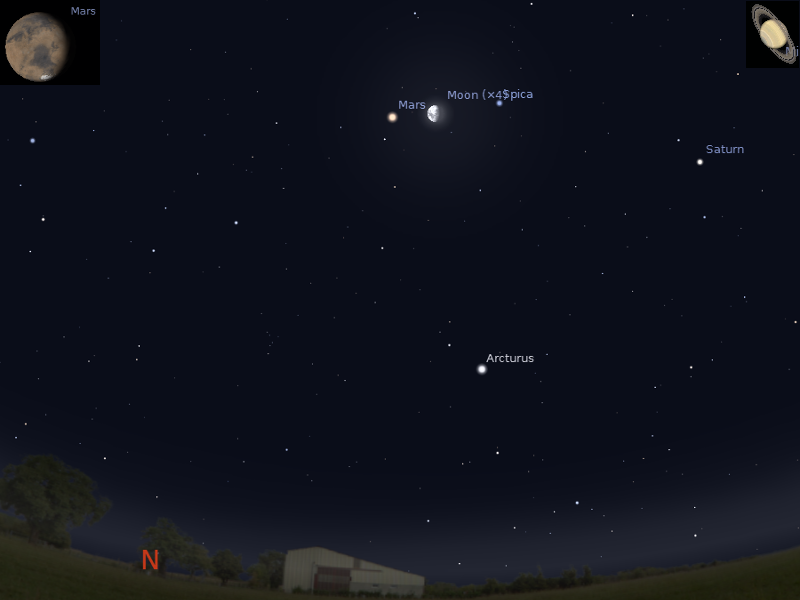 Mars is easily seen in the northern and north-western evening sky. It is highest in the sky around 19:00. Mars was at opposition, when it is biggest and brightest, on the 9th of April, and is still readily distinguishable as the bright red/orange object above the northern horizon in the early evening. Mars is in the constellation of Virgo near the brightish star Porrima, and is slowly coming closer to the bright star Spica. Mars is still worthwhile looking at in a telescope now, although you will need a decent one to see any detail. Saturn is rising higher in the evening sky, and was at opposition on the 11th. Saturn is visible all night long. Saturn is high enough from around 10 pm for decent telescopic observation (see below). Saturn is in Libra near the head of the constellation of the Scorpion and forms a shallow triangle with the two brightest stars of Libra, its apex pointing towards the head of the Scorpion. Morning sky on Monday June 30 looking north-east as seen from Adelaide at 6:30 am ACST. Venus is close to the bright star Aldebaran. Similar views will be seen throughout Australia at equivalent local times. (click to embiggen). 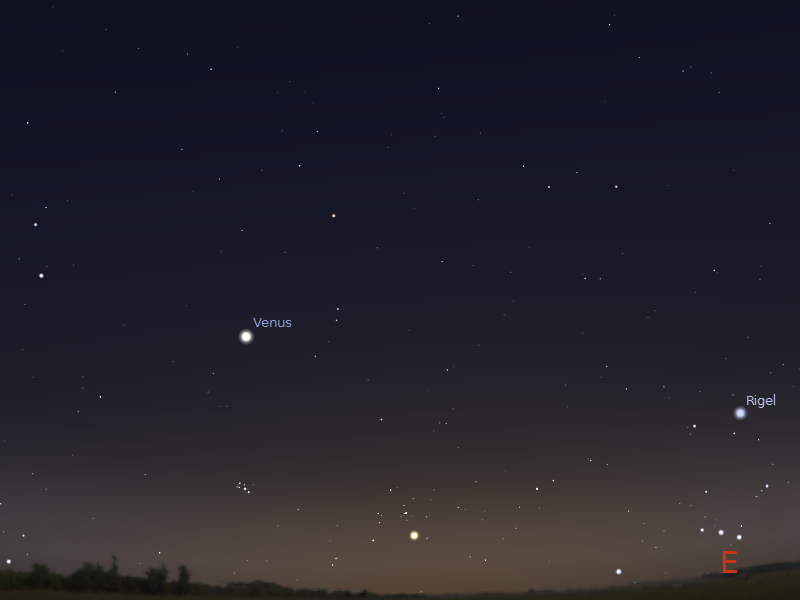 Venus is in the morning sky, above the north-eastern horizon. The brightest object in the morning sky, it is easy to see and although it is past maximum brightness, it will dominate the early morning sky for some time to come. Venus was at its furthest distance from the Sun on the 23rd of March, and is slowly sinking towards the horizon. Venus is a clear gibbous Moon shape in a telescope. During the week Venus passes close to the "A" shaped Hyades cluster that forms the head of the Bull. By the 30th Venus is close to the bright red star Aldebaran forming a second "eye" in the head of the Bull. Evening sky on Saturday June 28 looking west as seen from Adelaide at 22:00 pm ACST in South Australia. The inset shows the telescopic views of Saturn at this time. Similar views will be seen elsewhere at the equivalent local time (click to embiggen). There are lots of interesting things in the sky to view with a telescope. Especially with Mars and Venus and Saturn so prominent in the sky. If you don't have a telescope, now is a good time to visit one of your local astronomical societies open nights or the local planetariums. WA and Southern North Island New Zealand. around 5 minutes for your eyes to become dark adapted. The Last Quarter Moon is Friday June 20. The Earth is at Solstice on June 21. Jupiter is low in the early evening sky. 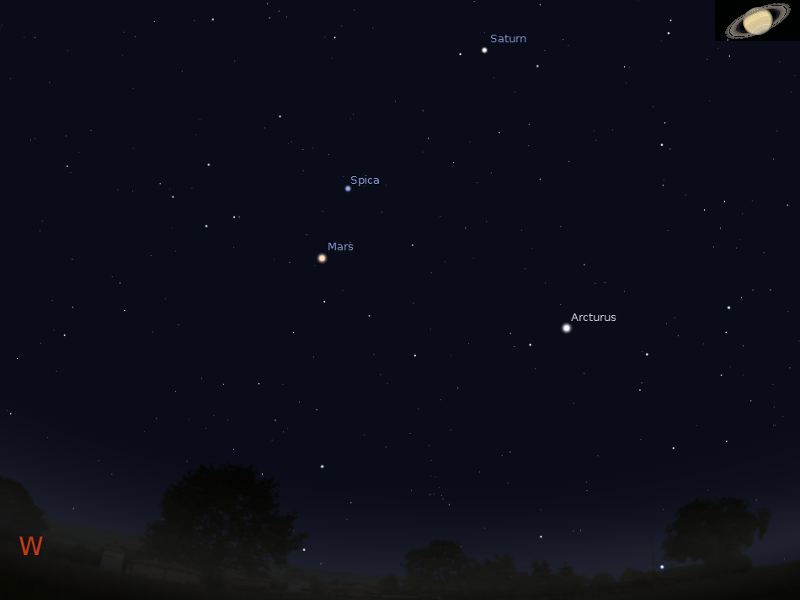 Mars and Saturn are prominent in the evening sky. Venus is prominent in the morning sky, coming closer to the red star Aldebaran. 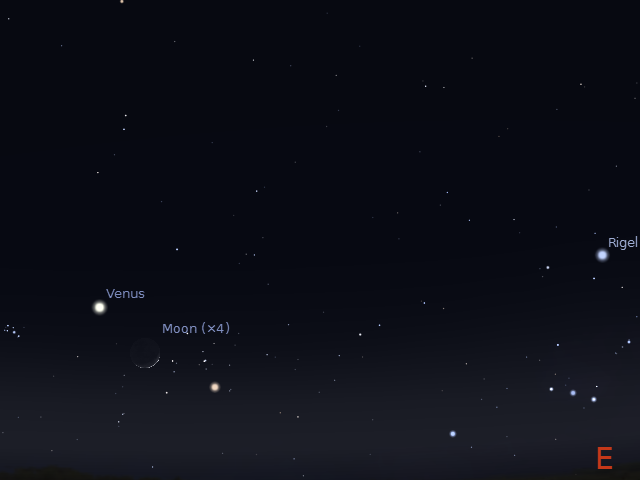 Venus is close to the crescent Moon on the 24th and 25th. The Last Quarter Moon is Friday June 20. 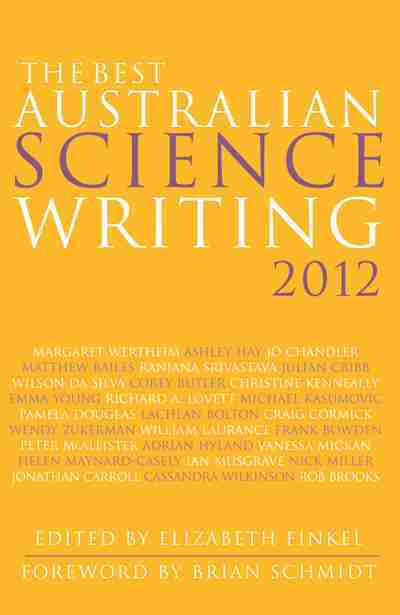 The Earth is at Solstice on June 21, when the night is the longest in the Southern hemisphere. Evening sky on Saturday June 21 looking north-west as seen from Adelaide at 18:00 pm ACST in South Australia. Jupiter is above the north-western horizon. Similar views will be seen elsewhere at the equivalent local time (click to embiggen). Morning sky on Wednesday June 25 looking east as seen from Adelaide at 6:30 am ACST. The crescent Moon is close to Venus, In between Venus and the bright star Aldebaran. Similar views will be seen throughout Australia at equivalent local times. (click to embiggen). Venus was at its furthest distance from the Sun on the 23rd of March, and is slowly sinking towards the horizon. Venus is a clear gibbous Moon shape in a telescope. During the week the shaped Hyades cluster that forms the head of the Bull rises to meet Venus. By mid week Venus is roughly between the bright unaided-eye clusters the Pleiades and the A-shaped Hyades, which houses the bright red star Aldebaran. on the 24th the crescent Moon and Venus are close, and on the 25th the crescent Moon is in between Venus and Aldebaran. Evening sky on Saturday June 14 looking east as seen from Adelaide at 22:00 pm ACST in South Australia. The inset shows the telescopic views of Saturn at this time. Friday the 13th Full Moon taken using my 4" Newtonian reflector and my Canon IXUS using a 25 mm eyepiece and infinity to infinity focusing. Due to the congruence of the Full Moon and superstition around Friday the 13th, flights of fancy are abounding on the internet. For one thing, this is NOT a supermoon (despite claims here). The Moon comes to perigee (closest approach to the Earth) two days after full this month, you need to wait until August 11 for an actual "Super Moon". Yes, Full Moons on Friday 13th re fairly rare, the last on we had was on October 2000 (but there was one before that in 1998), and the next will be in August 2049. Well, wow, that's rare right! Well, it is true of any arbitrary day date combination. Another full Moon falls on Friday November 7 this year. Prior to that a Friday 7 full Moon occurred in 1996, and the next will not be until February 2031. But we put a lot of meaning on Friday the 13th, Friday the 7th not so much. So the apparent rarity of Friday the 13th Full Moon impresses us compared to other Friday dates (Friday the 13th First Quarter, Last Quarter of New Moons don't impress us so much either). This is also the closest full Moon to the Solstice so the Moon is riding high in the Southern Skies, well worth going out and having a look. Some other good links here, and here. In Europe and America this full Moon is a "honey Moon", to the Algonquin Indians of North America it was a Strawberry Moon, but I couldn't find any Australian Indigenous names for seasonal Moons. For most Australian Aboriginal Groups the Moon was male, rather than female, for the local Karuna peoples of the Adelaide plains, the Moon was called Kakirra, for the Boorong peoples of north west Victoria the Moon, Mityan, represented the quoll or native cat. Quolls have full moon, half moon and crescent moon shapes on their coats. The Full Moon is Friday June 13. Jupiter is low in the early evening sky. 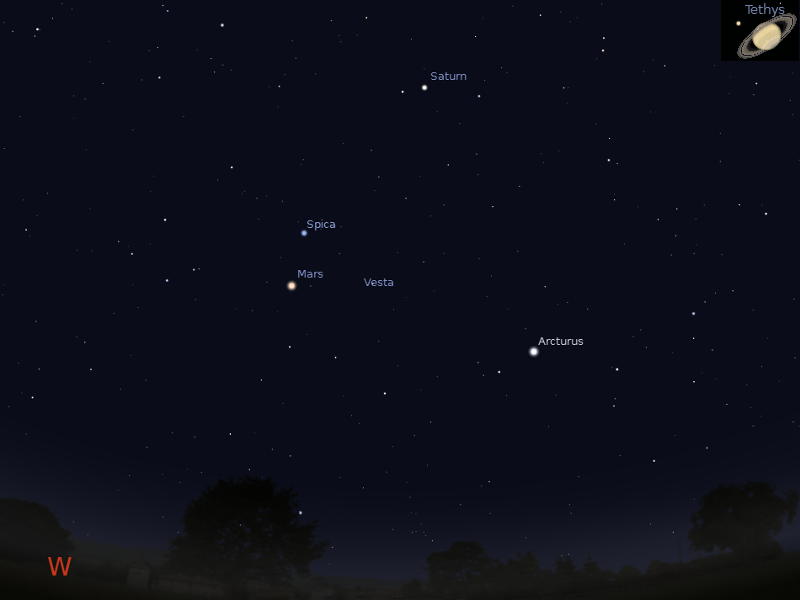 Mars and Saturn are prominent in the evening sky. Venus is prominent in the morning sky. Evening sky on Saturday June 14 looking north-west as seen from Adelaide at 18:00 pm ACST in South Australia. Jupiter is above the north-western horizon, Mercury is just above the horizon. Similar views will be seen elsewhere at the equivalent local time (click to embiggen). At 6:00 pm if you have a level horizon free of obstructions, you can see three bright planets strung out across the sky, Jupiter just above the horizon, Mars high in the northern sky and Saturn rising in the west. Jupiter is low to the horizon when twilight ends. Jupiter sets around 19:30, telescopic observation is not really worthwhile now. Mars is easily seen in the northern evening sky. It is highest in the sky around 19:30. Mars was at opposition, when it is biggest and brightest, on the 9th of April, and is still readily distinguishable as the bright red/orange object above the northern evening horizon. Mars is in the constellation of Virgo near the brightish star Porrima, not far from the bright star Spica. Mars is still worthwhile looking at in a telescope now, although you will need a decent one to see any detail. Morning sky on Sunday June 15 looking east as seen from Adelaide at 6:30 am ACST. Similar views will be seen throughout Australia at equivalent local times. (click to embiggen). Venus was at its furthest distance from the Sun on the 23rd of March, and is slowly sinking towards the horizon. Venus is a clear gibbous Moon shape in a telescope. During the week the shaped Hyades cluster that forms the head of the Bull rises to meet Venus. Evening sky on Saturday June 14 looking east as seen from Adelaide at 22:00 pm ACST in South Australia. The inset shows the telescopic views of Saturn and Mars at this time. 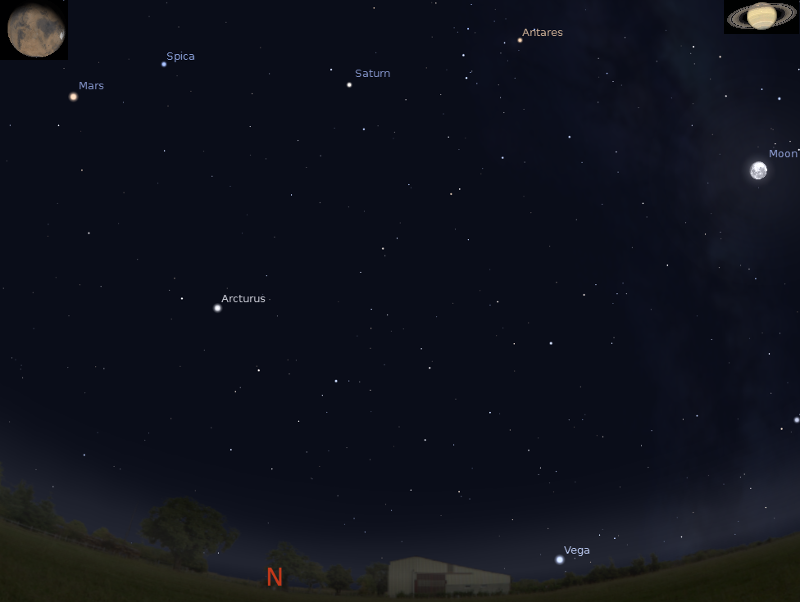 The bright asteroid 4 Vesta is visible in binoculars in the evening sky. 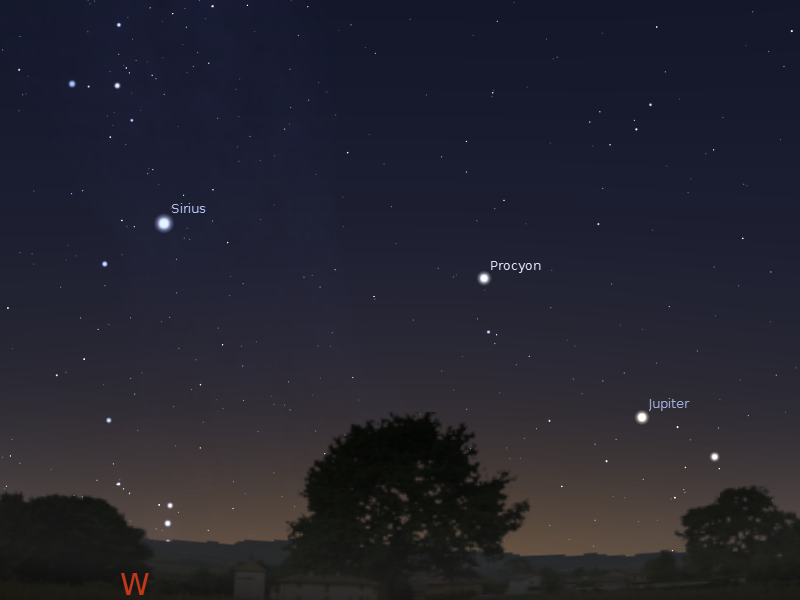 While Vesta is easily seen in binoculars, you will need to watch the same patch of sky in binoculars for a couple of nights to identify it by its movement. Tiss week the brightness of the Moon interferes with viewing Vesta. 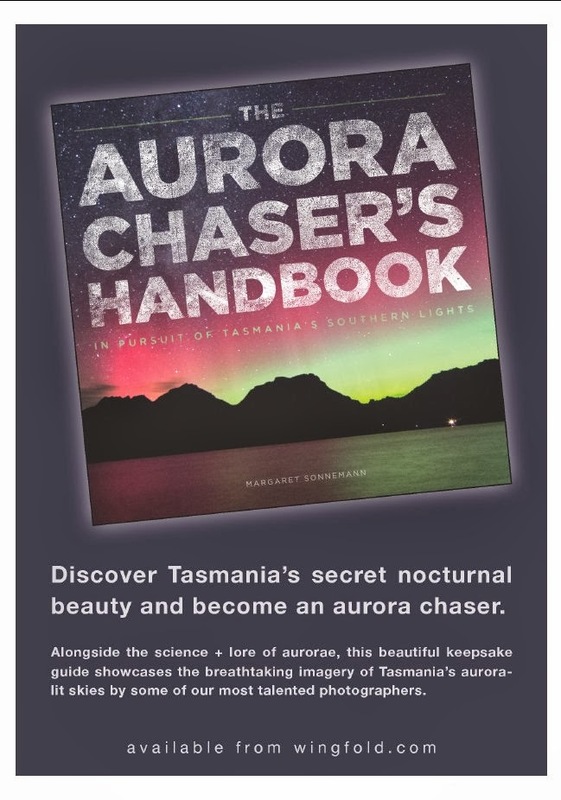 Southern Skywatch June, 2014 edition is now out! Morning sky on June 25 looking east as seen from Adelaide at 6:00 am ACST. Similar views will be seen throughout Australia at equivalent local times. (click to embiggen). The June edition of Southern Skywatch is now up. This month is a bit more sedate than previous months, but there is still some nice sky watching to be done. 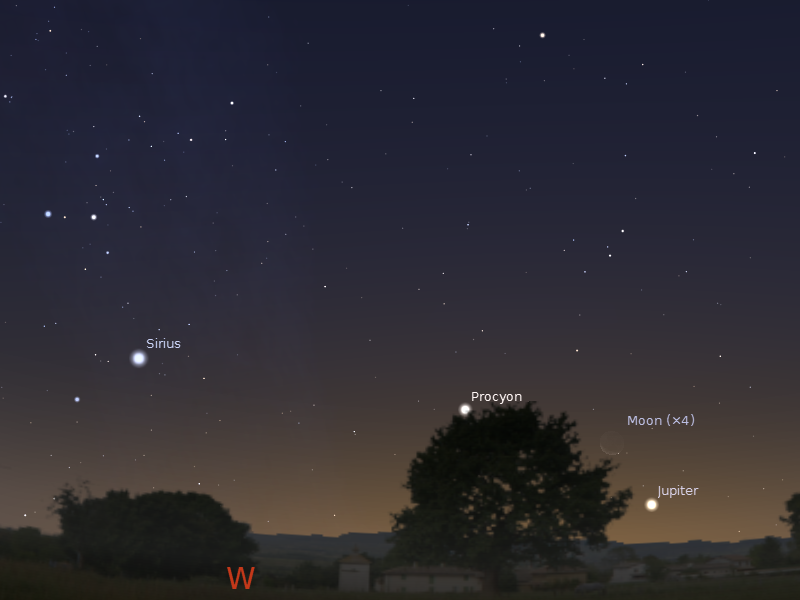 There's a bit of planetary action this month with Venus, Jupiter, Saturn and Mars meeting the Moon. Jupiter sinks towards the north-western horizon in the early evening. Jupiter is also near the Moon on the 1st and 29th. Mars is obvious in the eastern evening sky. Mars is near the Moon on the 7th and 8th. Saturn climbs higher in the evening sky and is close to the Moon on the 10th. Venus is close to the crescent Moon on the 25th. Mercury returns to the morning sky late in the month. The First Quarter Moon is Friday June 6. Jupiter is low in the early evening sky. Mercury is low in the evening sky below Jupiter. Mars and Saturn are prominent in the evening sky. The Moon is close to Mars on June 7 and 8, and Saturn on June 10. Venus is prominent in the morning sky. The First Quarter Moon is Friday June 6. Evening sky on Saturday June 7 looking north-west as seen from Adelaide at 18:00 pm ACST in South Australia. Jupiter is above the north-western horizon, Mercury is just above the horizon. Similar views will be seen elsewhere at the equivalent local time (click to embiggen). 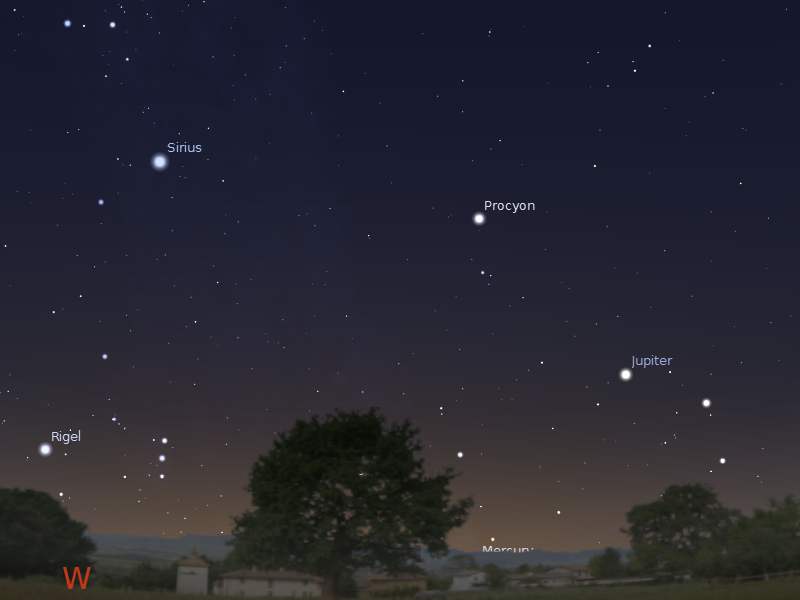 At 6:00 pm if you have a level horizon free of obstructions, you can see four bright planets strung out across the sky, Mercury just above the horizon, Jupiter above that, Mars high in the northern sky and Saturn rising in the west. Mercury is low in the evening sky in the western twilight. This will be effectively the last week for a good view of the fleet planet before it disappears into the twilight. Jupiter is low to the horizon when twilight ends. Jupiter sets around 19:45, telescopic observation is not really worthwhile now. 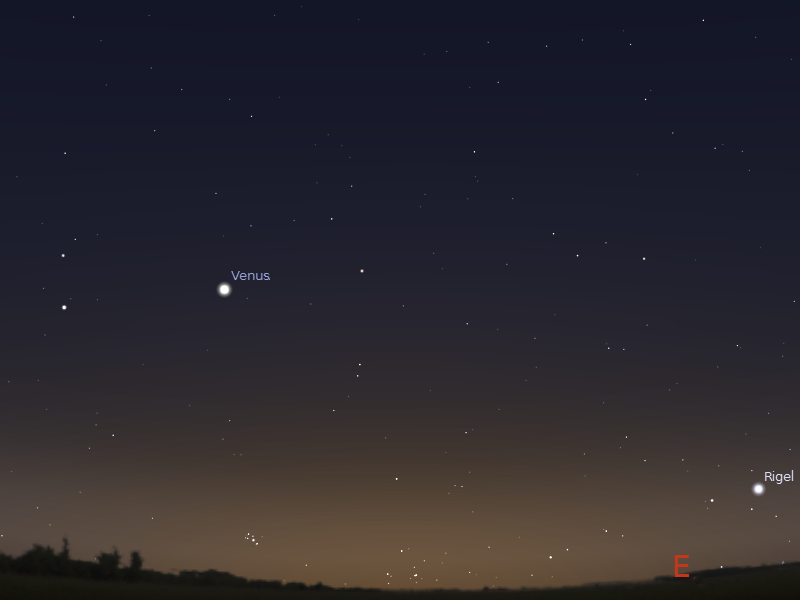 Mars is easily seen in the northern evening sky. It is highest in the sky around 20:00. Mars was at opposition, when it is biggest and brightest, on the 9th of April, and is still readily distinguishable as the bright red/orange object above the northern evening horizon. Mars is in the constellation of Virgo near the brightish star Porrima, not far from the bright star Spica. Mars is still worthwhile looking at in a telescope now, although you will need a decent one to see any detail. Saturn is rising higher in the evening sky, and was at opposition on the 11th. Saturn is visible all night long. Saturn is high enough from around 10 pm for decent telescopic observation (see below). Saturn is in Libra near the head of the constellation of the Scorpion and forms a triangle with the two brightest stars of Libra, its apex pointing towards the head of the Scorpion. Morning sky on Saturday June 7 looking east as seen from Adelaide at 6:30 am ACST. Similar views will be seen throughout Australia at equivalent local times. (click to embiggen). Venus is in the morning sky, above the north-eastern horizon. The brightest object in the morning sky, it is now easy to see and although it is past maximum brightness, it will dominate the early morning sky for some time to come. Venus was at its furthest distance from the Sun on the 23rd of March, and is slowly sinking towards the horizon. Venus is a clear gibbous Moon shape in a telescope. Evening sky on Sunday June 8 looking east as seen from Adelaide at 19:00 pm ACST in South Australia. The Moon is close to Mars.The inset shows the telescopic views of Saturn and Mars at this time. 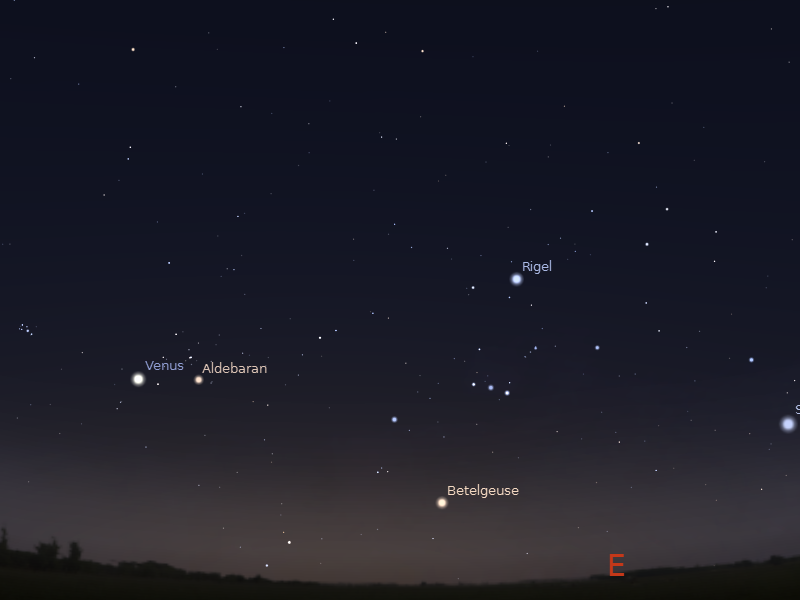 The bright asteroid 4 Vesta is visible in binoculars in the evening sky. While Vesta is easily seen in binoculars, you will need to watch the same patch of sky in binoculars for a couple of nights to identify it by its movement.